Happy weekend everyone! Wow, I can't believe it's been over two years since my last blog post. Time sure does have a way of rushing by. It's been a good, if busy, two years, but all in all things have been good here. I hope you had a good couple of years as well. 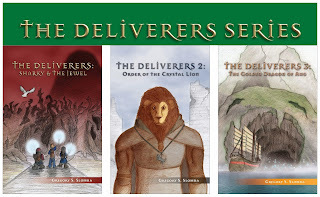 When last I posted, I was working on book four in the Deliverers Series. Since then I've been busy working (new job with the same company), and watching the family grow. Christian is now a freshman in high school and Abby is in 7th grade and they're doing all sorts of thing from marching band to bowling leagues to Girl Scouts. Stephanie has been running races and is trying to run a race in all 169 towns in Connecticut (she's at 41 right now). Needless to say, things have been quite busy. Periodically, I've entertained thoughts of getting back to my writing. I've struggled with the question of whether to finish Eric's story, or to venture out on a new path. After much internal debate, I've decided to continue Eric's journey through to the end. I'm not sure where that will lead, but right now completing his story is the goal. I am currently in the process of reevaluating what I've written on book 4 so far. Once I've done that, I'll rewrite the parts that need to be and carry on. I don't know if I'll publish the remaining books in the series or not. I will definitely serialize them here and I may wind up publishing a Kindle version. We'll see how things go. I would dearly love and appreciate any feedback you could give as I post pieces of the story here. That would be a great help! That's it for now. I'll be back with another update soon.